They don’t tell you about it when you sign up for a tour, purchase an air ticket and visa, or arrive at immigration. But I am certain that there are insidious forces at work behind the scenes, on a pan-Asian scale; and it has nothing to do with widespread political corruption or struggling infrastructure. When you arrive in Asia, and you have the slightest concern about above-average exposure to the sun’s midday rays, you’re likely to do as I – go out an buy an umbrella. 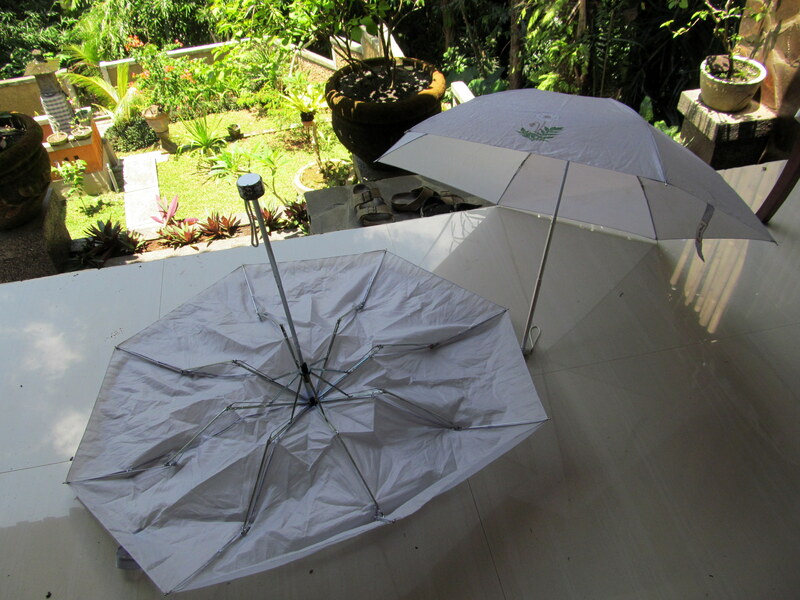 And, if like me, you carry it around all the time, trying to ward off both sun and rain (plentiful during rainy season! ), then you’re subjecting yourself to the forces of nature at every turn: sudden gusts of wind that threaten to lift you AND your umbrella into the heavens; powerful rain showers that confirm the impotency of cheap-Chinese-made stuff. Umbrella manufacturers, the villains behind this tax, are well aware of this predicament. It’s guaranteed obsolescence, par excellence. A little while ago, I returned from Delta supermarket where I bought what must be my eighth umbrella since I arrived in Asia – seven months ago. I bought my two previous ones in Singapore at the end of October; the first at Mustafa Center, for which I paid the exhorbitant price of $10 – and it promptly broke down before I’d reached my next destination. The second one is on its last legs. Yesterday, I asked the shoe-and-umbrella repairman in my neighborhood to fix it (as I usually do), but after twisting and cutting metal here and there, he gave up. Most of them do. At least the honest ones, those who are probably equally frazzled with the workmanship (or lack thereof) of the umbrellas I lay on their repair-bikes. So do the math. One umbrella a month at about $4-5 a pop. There it is, the hidden but ubiquitous umbrella tax. I suppose that, rather than getting angry, I simply ought to react in the most equanimous way – I am in Asia after all – and just accept that I am obligated to pay an extra $5-10 per month for the privilege of (ahem) outfitting myself with an umbrella. Hey..want me to send you a mini one from here?? ?